We certainly live in a complicated era. It is a time of unprecedented media saturation, cultural overload and artistic freedom. Our interests and entertainment can be catered to with content from all over the world. Big Hero 6 is a film about dealing with loss and learning to remain positive in the wake of tragedy but it offers more than that. The fictional and outlandish setting of San Fransokyo represents the merging of Western and Eastern culture that is already happening on a smaller scale in the real world, with cultural diversity becoming stronger every year. Released in the UK on January 30th 2015, Big Hero 6, directed by Don Hall and Chris Williams, received a warm reception the world over. This degree of global success is more palpable than usual, given the film’s extreme success in Japan and Korea, where it remained the top grossing movie for first three weeks of its release and has made over $60 million in those countries alone in that time. As it would seem Big Hero 6 has managed to successfully interpret elements of modern Eastern culture in the influences of its setting, and then market these cultures overseas at film back to them to turn a profit. While it is relatively common for foreign productions to attempt to tailor to Western tastes, it is quite rare to see the reverse, bringing with it reasonable box office numbers in the West, along with an Academy Award for Best Animated Feature Film, demonstrating its favorable success critically. Loosely based on the Marvel comic book series of the same name, Big Hero 6 tells the story of Hiro Hamada (voiced by Ryan Potter), a boy genius who enlists the support of his friends to form a team of superheroes. In the wake of a terrible tragedy committed by an unknown villain, Hiro sets out to bring the culprit to justice and save the city of San Fransokyo from the evil scientific mastermind. He is aided by his older brother’s greatest project and best friend: a medical robot turned superhero named Baymax (voiced by Scott Adsit). 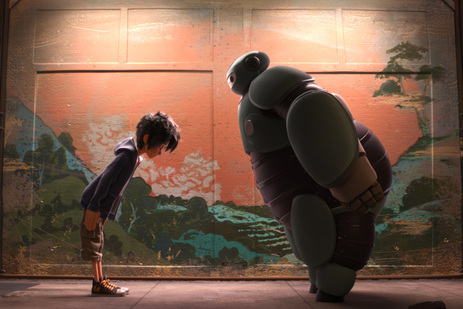 Baymax represents core themes of the narrative: he is a funny, inflatable robotic nurse, designed specifically to be non-threatening and a pacifist that has been rather awkwardly transformed into a heroic flying guardian of the city. The transition is unnatural and difficult for Baymax, as well as the rest of the team, but through perseverance they manage to save the day. The film marks something of a significant departure for Disney, given its eclectic setting and progressive characters that shirk traditional stereotypes and tropes. 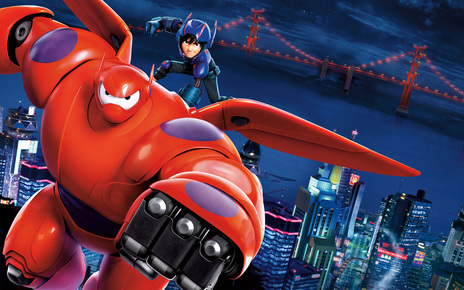 Following the release of the unconventional princess story Frozen (2013), which also did surprisingly well in Eastern markets with notably high box office figures in Japan, South Korea and China, Big Hero 6 represents a bold, new direction for Disney who seem to have developed a taste for offering content that pushes the envelope by defying genre expectations in both theme and characterization. 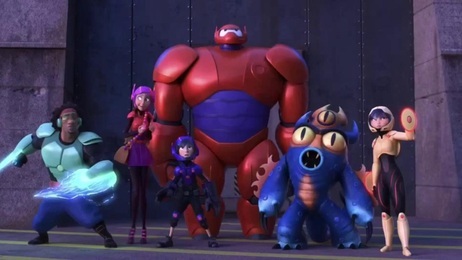 The change from Big Hero 6’s concept art, however, displays just how far the project has progressed from the drawing board, evolving from Disney’s ode to anime into what was eventually released in cinemas. The original concept clearly saw some redirection from producers who knew they were treading uncharted territory. 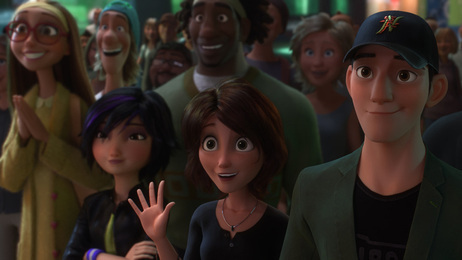 Some of this riskier concept art that depicts the cultural hybridity that Big Hero 6 intended to present is most obviously apparent in the backgrounds that appear during the film’s credits, illustrations of crammed train interiors, sushi bars and an edgier female lead represents a small taste of the initial concepts that would be refined and compromised to produce an Oscar-winning animated production. Nonetheless, the iconic image of Los Angeles’s golden gate bridge, the iconic suspension towers reinterpreted as Torii (Traditional Japanese arches), paints a striking picture of a world of cultural variety akin to Firefly (2002-2003) or Nickelodeon series Avatar the Last Airbender (2005-2008). Ultimately, Big Hero 6 represents a disparate and beautiful departure from what we have come to expect from modern cinema, and specifically Disney. This film is a highly progressive and globally cognizant adventure, the likes of which is at once unexpected but most welcome in modern cinema.